1. Sundt Construction, Inc. recently started construction on the University of Arizona Student Success District in Tucson. The project will transform the Main Library, the Science-Engineering Library, and Bear Down Gym, while adding a new four-story student success building into an interconnected district, which will provide indoor and outdoor spaces. The project is being delivered via design-build delivery method with Sundt’s design partners of Miller Hull and Poster Frost Mirto. The multi-facility project is expected to be fully completed and open to students by 2021. 2. Irgens Phoenix has announced the groundbreaking of its newest development, 17 Three Hundred at Perimeter Center. The two-story, Class A office building at 17300 N. Perimeter Dr. is scheduled for completion in October. The architect is Vertical Design Studios and the general contractor is RSG Builders. 3. The years-long South Mountain Freeway project in the Phoenix area has reached another important milestone. The southbound frontage road along 59th Avenue between Van Buren Street and Buckeye Road in west Phoenix is open for two-way traffic. The northbound frontage road will be constructed later this year. The whole project is expected to be complete in 2020. 4. Self-driving car company Waymo plans to more than double its Arizona operations this year with a new 85KSF Technical Service Center in Mesa. The center is expected to open in a few months. 5. Ina Road has opened over Interstate 10 in Marana, a major step toward completing a modern traffic interchange that is one of the Tucson area’s largest road projects in years. Ramps connecting Ina Road with I-10 are expected to open in the next few weeks. The final pieces of the $128M ADOT project will be completed later this spring. 6. Harrah’s Ak-Chin Casino recently completed a multimillion-dollar construction project featuring renovations property wide. The project included a new 12-story hotel that adds an additional 230 rooms, an expanded gaming floor and ballroom, a 3KSF spa and an update of all hotel rooms. 7. Downtown Gilbert’s newest parking structure, Hearne Plaza Garage opened to the public on Saturday, March 16th. The garage added nearly 600 new parking spaces to the Heritage District, including six electric vehicle charging stations. 8. 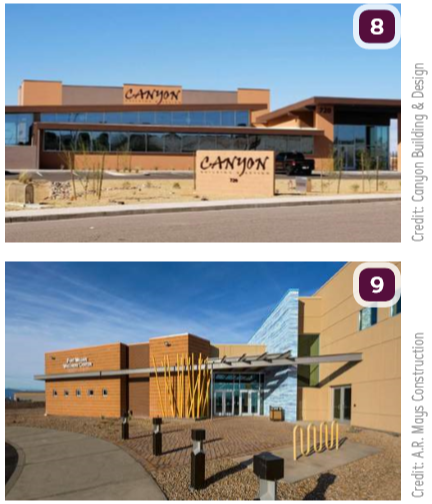 Canyon Building & Design held a ribbon cutting ceremony for their opening of their new building at 720 E. Iris Place, Chandler. 9. A.R. Mays Construction recently completed construction on the Fort Mojave Wellness Center, an $8.5M, 48.6KSF facility that includes an indoor pool, gymnasium, locker rooms, dedicated women’s workout area, group fitness room, elevated running track, teaching kitchen and office space. The architect was Mittelstaedt Cooper & Associates.